This is our brightly colored magic castle, this unit features bright hues of red, blue and yellow. 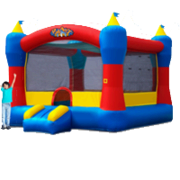 Watch the magic happen as your kids bounce, jump and play all day in this bounce house. When the party is over the kids will magically fall asleep from being worn out from all the fun they had in this unit.